Yesterday as I stepped out of my back door, bin in hand, to make my usual short trip to the Compost heap, I stopped dead in my tracks as a whisper of red flitted before my eyes. In a moment it was gone, bounding across the terrace and slipping through the gaps in the gate. But there was no mistaking it - a red squirrel! Oh joy! At last! After 10 years I had finally enticed one of the IOW's best loved mammals to my door. 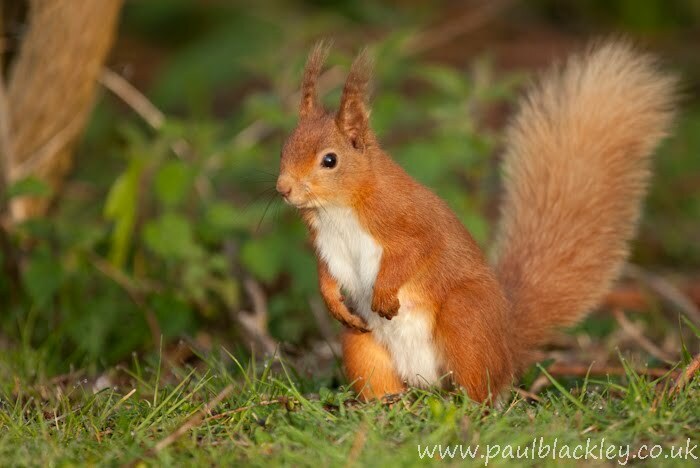 I am truly passionate about these lovely little creatures and set about planting my garden and surrounds with mainly native trees and shrubs that squirrels feed on. I even planted a 50 metre long 'squirrel walk' of just hazels to create a 'wildlife corridor' . This would enable them to safely stay in the trees from the road boundary to my garden. Such was my vision as I planted very small hazel 'whips ( bare-rooted one year old saplings) one cold winter morning through the stripped turf. At last it seems as if my patience has been rewarded. I know that they have never been far away, in fact at either end of my road and sometimes in my neighbour's gardens.But when would my turn come? I believe that a bold individual encouraged both by the tree cover and also the bird feeders all around my garden has done the trick. So planting hazel, chestnut, beech, hornbeam, pines, filberts will all help to encourage red squirrels. Proof indeed! I just can't wait to see them coming regularly now so that I can get some pictures like this one of Paul Blackley's, acclaimed IOW Wildlife Photographer. He has also given some useful tips on hiding nuts in strategic places in order to get that 'special' picture.